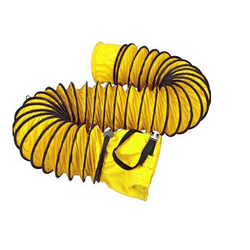 Our company offers an advanced range of PVC Ducting Hose. The production of these products is done as per prevailing standards to ensure that they are safe to use and durable. We also procure best of the raw materials to manufacture them. These products are extremely flexible and vacuum proof. They are reasonably priced. Flexible Low/High Temperature Light Weight Ducting Hose for Various application in Industries and Aviation air crafts. In material like PVC, Polyeurathene, Silicon, Neoprene, Santropene, and others. Looking for Ducting Hose ?